This webpage was finally updated on 2/1/15 with all of their newer photos that we posted on Facebook a long time ago! Refresh the page to see the updates! This webpage was last updated 5/27/15. 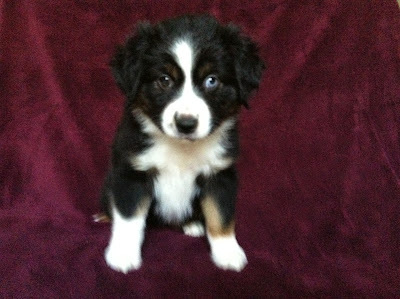 We only have 5 puppies available and will be matching them very soon! Preston, Grayson, McKenna, Tilly, and Misty are still available for adoption! So please let us know if you are still interested! 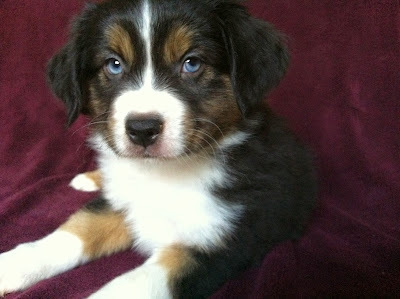 You must submit a puppy application to be considered for adoption! The application can be downloaded at the very bottom of this page. 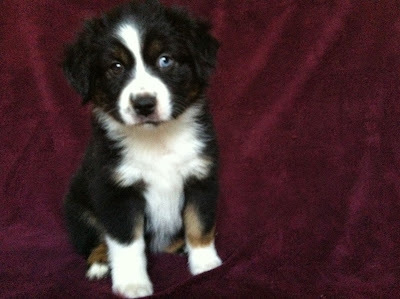 Go look at all the new adorable puppy photos! They're so cute!! On November 3rd and 4th, we had 9 new puppies! These puppies will turn 8 weeks old right around Christmas time! There are 6 girls and 3 boys! 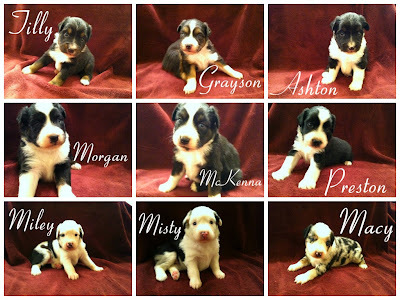 3 black tri girls, 3 blue merle girls, 2 black tri boys, and 1 dilute blue tri boy! Their names are Ashton, Preston, Grayson, Tilly, Misty, Miley, Macy, Morgan, and McKenna! Also, 6 of the 9 puppies have blue eyes! All 3 of the blue merle girls Misty, Miley, and Macy have two blue eyes, and Grayson the dilute blue tri has two blue eyes. Morgan and McKenna the twin black tri girls each have one blue eye on the same side! 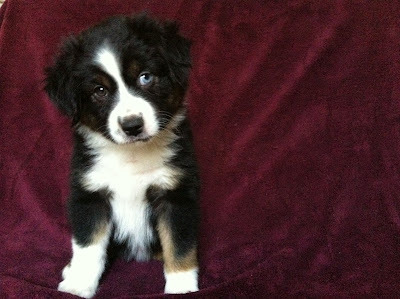 Amazing All-Star Mini Aussie Puppies Show Off Their Tricks! If you are interested in adopting one of our puppies, please scroll down to the very bottom of the page and download our All-Star Puppy Adoption Application in pdf or doc format. Then fill it out in detail and submit it to us at AllStarAussies@gmail.com You must submit an application to be considered for adoption! If you already submitted your application, then thank you very much! 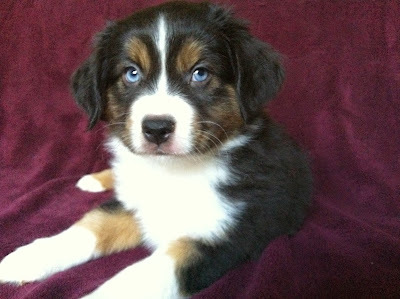 We have received it and are watching the puppies to see which one will be a match for you given your preferences! If you do not hear from us for a long time, don't worry we are just very busy training 9 puppies and teaching students during the school year! 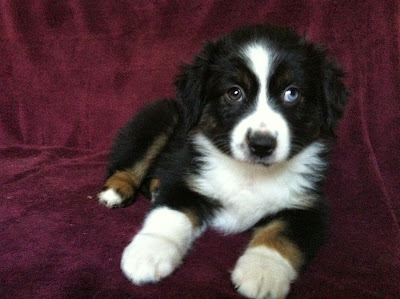 We will let you know when the puppies are a little older if we have a match for you! 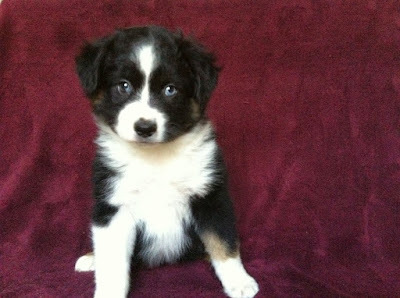 We match our puppies by personality and desired traits with the right family. We are puppy matchmakers! We will keep watching the puppies as they grow up and around 6 weeks old we can see more of their personality and can start to figure out the best family match for each puppy. Thank you for being patient during this long and intricate adoption process! It is well worth the wait since your puppy will be your loyal and devoted companion for 15 years! Here are the puppies!! I can't tell very much about their personalities yet since they are only 3 weeks old and just recently opened their eyes and started walking, but some seem a little more outgoing and bold while others are a bit more laid back or calm. However, this can change between now and 8 weeks old as they are still very young. They will show their personalities more starting around 5 to 6 weeks old, and we will start to make puppy matches around 10-12 weeks old. 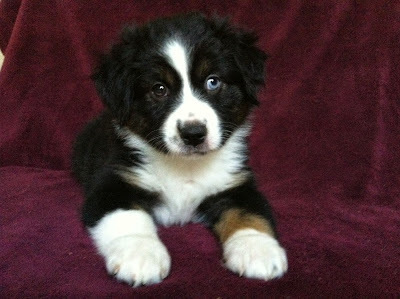 Enjoy the cute puppy pictures! Ashton -ADOPTED! (1/24) His new name is Austin! 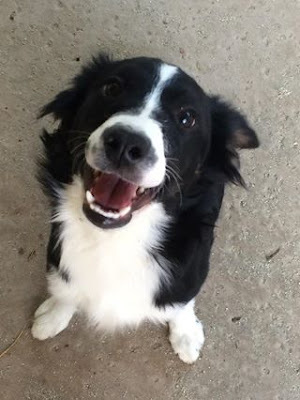 Ashton is an adorable little black tri boy with two brown eyes and a full white collar. He already seems very sweet, calm, and laid back. Ashton - 6 Weeks Old - Adopted! 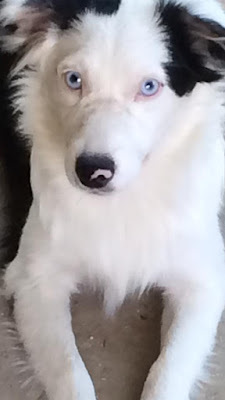 Grayson is a very handsome blue tri boy with blue eyes and pretty copper markings! 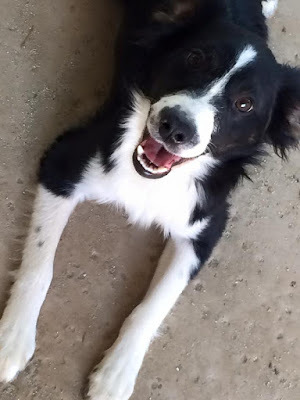 He already seems very friendly and outgoing, and wanting to explore and say hi with Morgan. He is so regal, dapper, and handsome!! 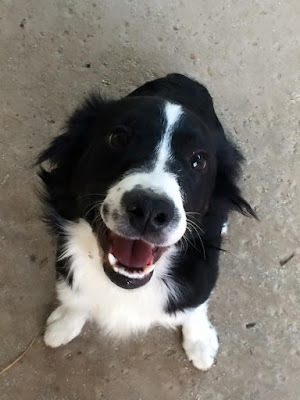 Preston is a very handsome black tri boy with two brown eyes and flashy white markings. He already seems friendly, outgoing, and sweet. Unfortunately, Preston's photos disappeared when my phone broke so he doesn't have any 6 week old ones. They were super cute ones with a bowtie and everything!! He is the cutest little guy ever though! For now, this is all I have but I will take new ones with a bowtie soon! Just know that he is little and absolutely adorable! He is a cutie pie! 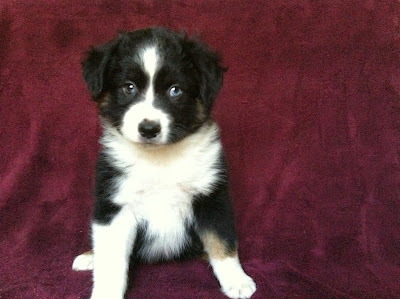 Tilly is a super cute tiny little black tri girl with pretty copper markings and two brown eyes. She already seems friendly and sweet. 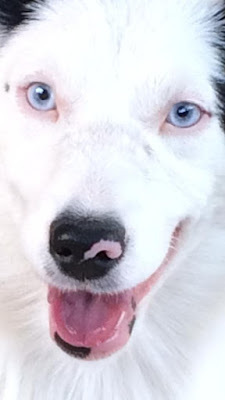 Misty is a pretty blue merle harlequin girl with two blue eyes. She already seems sweet. 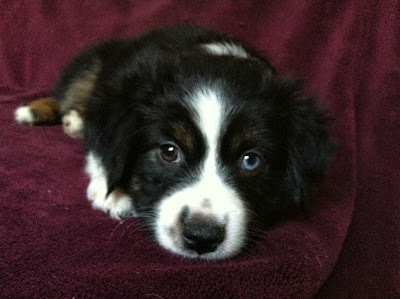 Miley -ADOPTED! 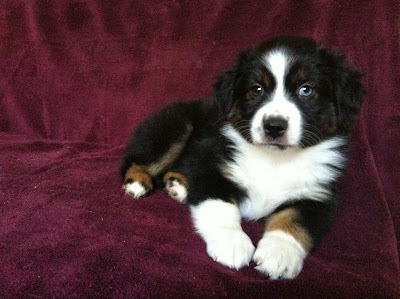 (3/27/15) She is going to go live with Easton (Ethan) from our Feb 2013 litter! 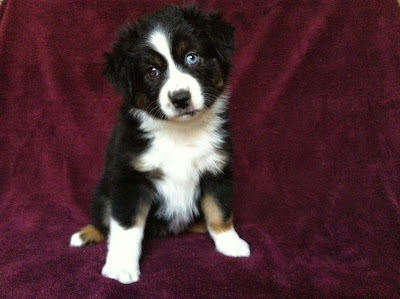 Miley is an adorable and pretty blue merle harlequin girl with two blue eyes. 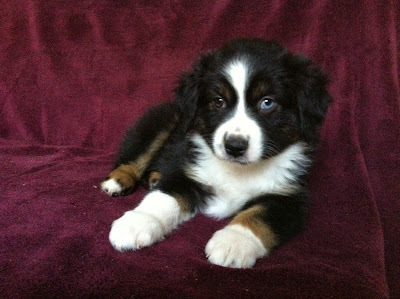 She already seems very sweet, cuddly, and laid back. McKenna is a pretty black tri girl with white and copper markings and one blue eye. 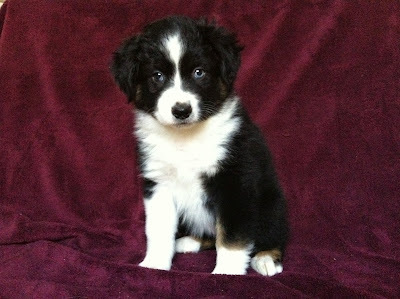 She already seems friendly, sweet, and more laid back than her twin sister Morgan. 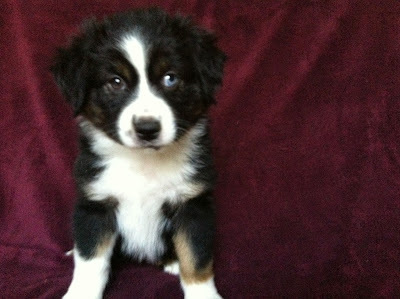 Morgan -ADOPTED! (4/1/15) Morgan's new name is Ellie! 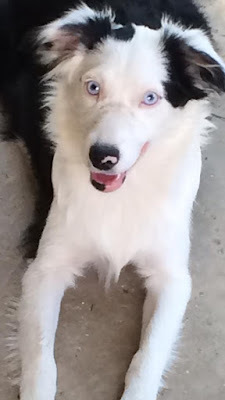 Morgan is a gorgeous black tri girl with flashy white markings and one blue eye. She already seems very outgoing, friendly, and wanting to explore and say hi with Grayson. Morgan knows what she wants! 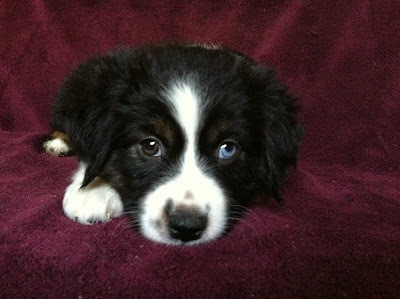 Macy is a gorgeous blue merle girl with two blue eyes. She already seems very calm, sweet, and laid back.